Professors at New Mexico State University are going further than they have ever gone before, using scaled-down versions of equipment that may eventually be used to search for life on other planets. 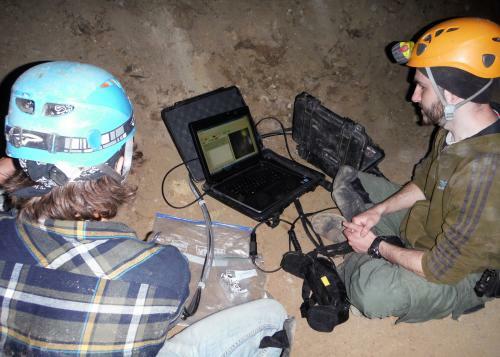 At Fort Stanton Cave near Ruidoso, a team of faculty and graduate students recently tried something new – simultaneous, on-the-spot analysis of rock samples with instruments small enough to fit in a backpack. The two instruments used at Fort Stanton Cave included a Portable AOTF Spectrometer for Astrobiology (PASA) and a 30-pound backpack model Laser-Induced Breakdown Spectroscopy (LIBS). “The objective of the program was to use two different technologies – one of which we developed through a partnership through astronomy and electrical engineering and the other which has been developed with the geology department — to look at samples of rocks in caves to see if we can identify signatures of life,” said Nancy Chanover, associate professor of astronomy. A LIBS instrument gathers the chemical composition of an object using a high-powered pulse laser that works in the visible portion of the spectrum, while the AOTF instrument collects reflectance information from a sample, indicative of its molecular structure, using a narrow portion of the spectrum in the near infrared. The project was funded with a nearly $40,000 Interdisciplinary Research Grant from NMSU’s Office of the Vice President for Research. The team includes McMillan, Chanover, David Voelz, professor of electrical engineering and David Cremers, from Applied Research Associates in Albuquerque, which built the backpack LIBS laser; along with graduate students Kyle Uckert, Ivan Dragulin and Arriana Chavez. The Fort Stanton Cave Study Project, a non-profit organization, was instrumental in assisting the NMSU researchers. Steve Peerman, director, and Wayne Walker, assistant director, helped Chanover and McMillan’s team in a number of ways, including gaining access to the cave and leading researchers to various sites within the cave. Both Chanover and McMillan say the equipment performed as expected. They will take the data obtained during the cave expedition and model it over the summer. Both researchers believe over time, equipment that now fits in a backpack may become even smaller and easier to use in extreme environments. By demonstrating that portable versions of this technology work in remote field locations on Earth, NMSU researchers will be in a better position to pursue larger research grants for developing flight-ready or flight-capable instrumentation to go on missions to other bodies in the solar system. “Ultimately we’d like to send our instrumentation to another planet to look for signatures of either current life or past life on those planets,” Chanover said. This entry was posted in Science Highlight and tagged astrobiology, caves. Bookmark the permalink. Follow any comments here with the RSS feed for this post. Both comments and trackbacks are currently closed.